Family members of a 40-year-old father and husband who police say was hit and killed by a driver with whom he had a brief argument gathered to mourn him Monday near the spot where he died over the weekend. 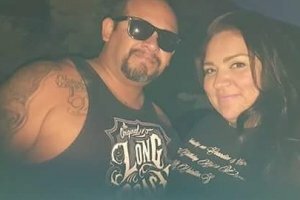 Family members said all of Victor Herrera’s seven children witnessed his dying moments after running to help their father last Saturday night. Herrera was walking home from a market with his 12-year-old daughter when the incident occurred around 11 p.m. As the pair was in a crosswalk at the intersection of Orange Avenue and East Market Street, he got into an altercation with a driver, according to Long Beach police. The motorist pulled his red sedan into a parking lot across the street and continued to yell at Herrera, surveillance video obtained by police shows. At that point, Herrera told his daughter to run home and get him help. Another surveillance video shows several family members running around the block to the scene. Escobar said the group witnessed as the driver pulled out of the parking lot and struck Herrera. “He died protecting his family, at all costs,” one woman who attended Monday’s vigil said. The driver, meanwhile, fled the scene. Later, police spotted what appeared to be a drunken driver. But when they attempted to pull the man over, he took off and crashed into a parked car, officials said. The officers determined the man, 29-year-old Long Beach resident Sokhorn Hor, was the hit-and-run driver connected to Herrera’s death and arrested him on suspicion of murder. Along with his seven children, ranging in age from 1 to 19, Herrera leaves behind a wife and 5-month-old granddaughter. Herrera was remembered during Monday’s memorial as a family man with a big heart, someone who was the life of the party and great at giving advice. Hor was being held on $2 million bail and was expected to be arraigned Tuesday, authorities said. A GoFundMe campaign has been set up to help Herrera’s family pay for his funeral costs.